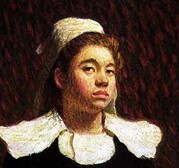 Famous Painters, Sculptors & Printmakers of Ireland, Born in the Nineteenth Century. 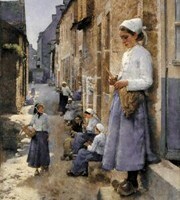 A Street in Brittany (1881). and plein air landscape artists. See below for an alphabetical list of Irish artists, born 1800-1899.
one of the more internationalist of Irish landscape artists and genre painters. Yeats, John Butler (Portraiture) (1839-1922).  For details about the most renowned painters and sculptors in Ireland, see: Irish Artists.  For a personal view of the top 10 or top 20 contemporary painters, see: Best Irish Artists.  For more about the development of culture in Ireland, see: History of Irish Art.